Walter Cronkite's UFO Encounter...Did It Happen? 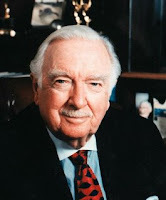 Walter Cronkite, the premier TV anchorman of the U.S. networks' golden age who reported a tumultuous time with reassuring authority and came to be called "the most trusted man in America." Cronkite was the face of CBS News from 1962 to 1981, when stories ranged from the John F. Kennedy assassination to the Iranian hostage crisis. According to UFO researcher Bill Knell (more on him below), in the 1950s Cronkite was part of a pool of news reporters brought out to a small South Pacific island to watch the test of a new Air Force missile...a large disc-type UFO appeared on the scene. Cronkite guessed that the object was about 50-60 feet in diameter, a dull grey color and had no visible means of propulsion. As Air Force guards ran toward the UFO with their dogs, the disc hovered about 30 feet off of the ground. Bill Knell's claim: In the 1950s Cronkite was part of a pool of News Reporters brought out to a small South Pacific island to watch the test of a new Air Force missile. After a short inspection of the new system by the reporters, they were lead to an area that was a safe distance from the launch site. The missile was mounted on a specially-built launcher that was attached to a cement base. It was obvious that the area had been quickly built just for the test. The details about the missile were going to be given to the reporters in he form of hand-out sheets and press releases after the test. Cronkite mentioned that he and the other reporters had been warned that photography of the missile test and any audio transmissions or recordings by the press were forbidden. They would have to give a written account of the event. Just as the test was ready to proceed, everyone was writing as fast as they could. As Air Force Security personnel walked around the perimeter of the test area with guard dogs and the news reporters watched, the missile was fired-up and about to be released. Just then, a large disc-type UFO appeared on the scene. As Air Force guards ran toward the UFO with their dogs, the disc hovered about 30 feet off of the ground. It suddenly sent out a blue beam of light which struck the missile, a guard and a dog all at the same time. The missile was frozen in mid-air about 70 feet from the launcher as it had taken off. A guard was frozen in mid-step and a dog frozen in mid-air as it had jumped at the disc. Cronkite reminded me that this all happened within the space of about five minutes or less. Suddenly, the missile exploded! After that, the disc vanished. The guard and dog looked alright, but were quickly taken away by medical personnel always present at tests in case anyone became injured. At the same time, guards rapidly ushered the reporters into a concrete observation bunker. After about thirty minutes of sitting in that hot box, they were brought out into the air again and addressed by an Air Force Colonel. The officer told them, "It was all part of the test." Obviously making it up as he went along, the Colonel said that the event was "staged" to test media reaction to UFOs. He reinforced the usual line to the reporters that Flying Saucers were probably not extra-terrestrial, but what people were actually seeing was secret planes being tested by the Air Force. This test was designed to show the media how "shocking" it could be to suddenly view a new technology. Well, Cronkite was certain that what he viewed was a new technology, but he was also sure it was not an Earthly one! He didn't believe the Air Force explanation then, and he still didn't believe it at the time when he told me the story. After the event, reporters were told that since it was a test of media reaction to new technology, they could not report on it! But, they would be compensated later with exclusive stories on new Air Force projects (a promise that was never kept). Being as private as he was, Cronkite never did share with me his own beliefs about UFOs beyond the story he told me. I was so happy to have heard the story that I was afraid to ask anything further! The CBS UFO Special was filmed shortly after my meeting with Cronkite and I was included in it for just a few minutes. During the filming, I became aware that Cronkite had not shared his story with most of the other UFO investigators or witnesses. After the special aired I called one of Cronkite's staff members and asked him if he had ever heard the UFO story. He told me he had. Cronkite had only shared it with a few key people and it was NOT covered or even mentioned in the Special. I originally wrote the Cronkite article in 1998 for my website, but I thought readers at Paranormal News might enjoy it as well. 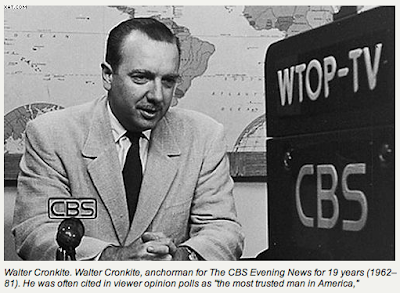 I met Cronkite in 1973 (as the article indicates) and that's when he told me the story. I have repeated the story ever since during many of my seminars and found that a few others had heard the story too. Most of them had heard it second hand or said that they had read it somewhere. At the time it happened, some of his staff knew about it, so I assumed it wasn't really a big secret. He didn't tell it to me in confidence, so I felt no obligation to keep it a secret. Since publications come and go and people have short memories for news, it's possible that Cronkite had once shared it in some long-forgotten interview. But I have never seen it in print. I feel that Cronkite's account of what happened is very credible. He seemed to be telling me the story from an honest memory of the event. When we conversed, he was very interested in the Air Force cover-up. I suspect that if he had more control over the 1973 documentary, he would have angled it in that direction. Instead, it was pretty much a neutral piece designed for ratings (from my memory). Although I have contacted CBS many times, they finally told me that any tape or film the UFO Special was on no longer exists and was probably lost in the shuffle of the news craziness surrounding Watergate (which broke big around that time). Like many important stories, this one has been around awhile, but I think alot of people in the UFO and Paranormal research community probably were too busy chasing false starts created by government disinformation to cover it. I recall that when everyone was running to Gulf Breeze in the late 80's and early 90's, I revealed a story regarding a trip by former general Doolittle (the leader of the famous bombing raid on Japan during the early part of WWII) to Spitzbergen and his possible connection to the recovery of a UFO. He was there in 1946 and may have obtained a UFO that crashed on the island during the war. I had met some sailors from the USS Alabama in the late 80's who said the object was brought back to the USA on the battleship Alabama. I started telling this story in my seminars as early as 1990, but noticed that the ABOUT.com UFO page attributes it to some 1950s or 60's article by someone I had never heard of? I also noticed that some of the MUFON people credited my original recording of the first radio interview given by Kenneth Arnold less then 12 hours after his 1947 sighting to some guy named Mike. I received that recording from a radio guy who had the original interview in the 70's and have been playing it in my seminars ever since. I assume that Mike lifted it off one of my audio or video sets and sent it to whoever at MUFON. No problem, just an illustration of how stuff is out there is you take some time to look at some of us little guys who aren't Richard, Budd or Whitley. Here's one more. In 1987 I met a guy that had worked with Jesse Marcel. He told me that some of the material shown in texas that was supposed to be from the weather balloon wreckage was actually from the real object. It was some of the lighter colored, small pieces laying on top of the balloon wreckage at the bottom of the press conference photos. I told that story to Friedman and others who laughed at it. Now I see that photo examination has revealed it to be true. But that didn't surprise me. I was amused to find out that most people in the UFO community didn't know that when THE ROSWELL INCIDENT was first published, Bill Moore still had never actually visited or set foot in Roswell! He wrote the book from all of Friedman's notes and by witness interviews over the phone. Moore finally went to the place later. Finally, I doubt that Cronkite kept the story a secret. Some of his staff knew about it and a few others I've met through the years. When he told it to me, he did it as calmly as someone reporting the weather. I think he just likes being in the driver's seat when it comes to his own life and experiences and might have even been a bit embarrassed by it all. Maybe he was just caught up in the moment and felt like getting it off his chest. Actually, I was the only UFO researcher there who didn't have anything to promote. I was a teen with a mimeographed UFO newsletter who got invited to speak at local libraries and Kiwanis Clubs. I think he might have told the story to the others as well, but most of them were very busy blowing their own horns and promoting their stuff. Look at the depths to which I've sunk since then. Now I'm blowing MY own horn! 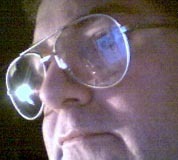 Bill Knell Internet Crook, Amazon Books, CDs , UFO LIAR, SCAM ARTIST !!!! A new biography of Walter Cronkite reveals the less trustworthy side of the most trusted man in America. The CBS anchor is remembered as a media giant who gruffly championed hard-hitting journalism. This is a mostly justifiable assessment. But some unscrupulous actions outlined in the book muddy his otherwise almost spotless reputation, and make clear how much the media has changed. For starters, he had no problem accepting freebies. These weren't occasional drinks, but flights to remote and luxurious vacation spots around he world for him and his friends and family, courtesy of now-defunct airline Pan Am. Staff members and those on assignment for us may not accept anything that could be construed as a payment for favorable coverage or for avoiding unfavorable coverage. They may not accept gifts, tickets, discounts, reimbursements or other benefits from individuals or organizations covered (or likely to be covered) by their newsroom.